The eerie quiet simulates space flight while the sterile, minimalist environment recalls the environs of an institution. “Mumbai is upgrading” warns a sign announcing the arrival of the metro outside the country’s first capsule hotel. Located on the first floor of a corporate park in suburban Mumbai, Urbanpod is a cool, silent world removed from the cacophony of the arterial road outside. Cars honk and the city’s red and silver public buses groan as they lumber into the nearby bus depot. Inside the hotel, there is an eerie silence, punctuated only be the ceaseless hum of central air-conditioning. The decor is minimal, the staff, in navy blue suits, is welcoming but brusque, and the security is on perpetual high-alert. This is not a hotel where you can check in anytime you like. The front door, like most doors in the establishment, can be accessed only with a key card. Urbanpod, founded by entrepreneur duo Shalabh Mittal and Hiren Gandhi, draws inspiration from a similar chain in Singapore, which in turn is based on Japan’s famous capsule hotels from the 1970s. 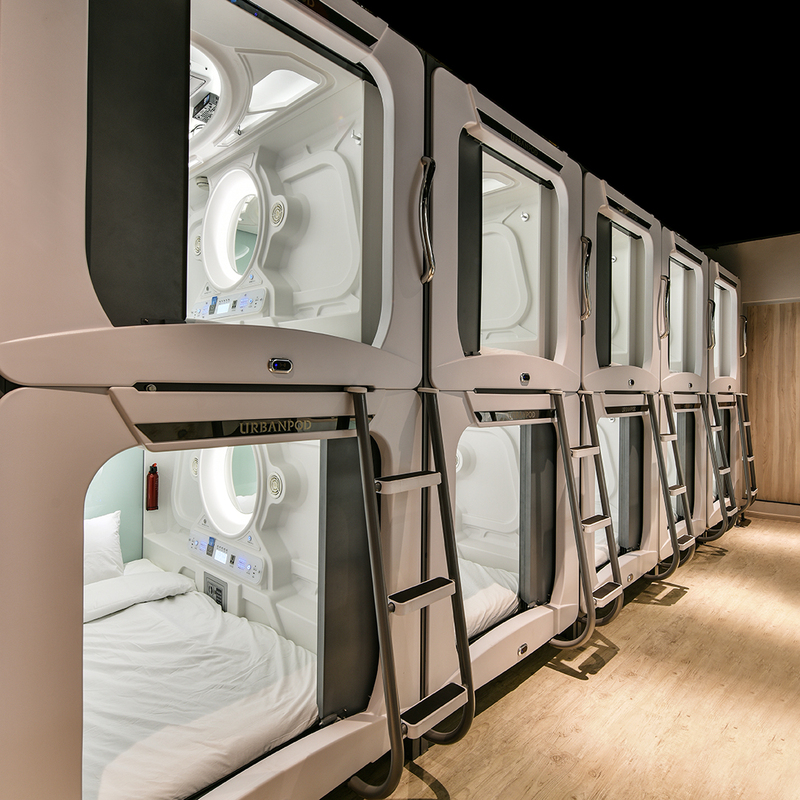 Originally created as an accommodation for businessmen looking for a few hours to spend the night after they missed the last train home, capsule hotels have steadily become a global trend. Entering a capsule resembles the opening moments of a slick Hollywood prison drama: shoes must be deposited in lockers outside the room containing the pods. The attendant hands every inmate a plastic wrapper containing a presumably freshly-washed towel, a television remote and a water bottle. This being a weekday, only one month since the hotel began operations in March, there aren’t too many customers. Inside the capsule, the absence of humanity compounded by the futuristic design simulates a space odyssey. The metaphor feels complete when the attendant explains the functions of every button contained on the panel inside the pod, akin to instructions doled out by a flight attendant. Personally, she isn’t too enamoured by the idea of the pods. “I have never slept alone, so found it weird,” she declared – a reminder that few in India have the luxury of privacy and space. Despite its compact appearance, the pod is sufficiently spacious, and not claustrophobic as one would presume. It is similar to the sleeper compartment of a double-decker overnight inter-city bus, minus the worn-out unhygienic appearance and odour. The corridors of the hotel are quiet, the shared bathrooms are clean and smell fresh. Every inch of the space is highly designed, there are buttons for everything, a smoke detector blinks in the background next to a miniature fire extinguisher. Despite the attention to detail, or maybe because of them, the experience feels highly cinematic. I realise that things could easily go wrong, just like they do in the countless science fiction films this set seems inspired from. A capsule doesn’t exactly allow for easy escape. Living in a space the size of a capsule room (or smaller) isn’t just a novelty experience for some. 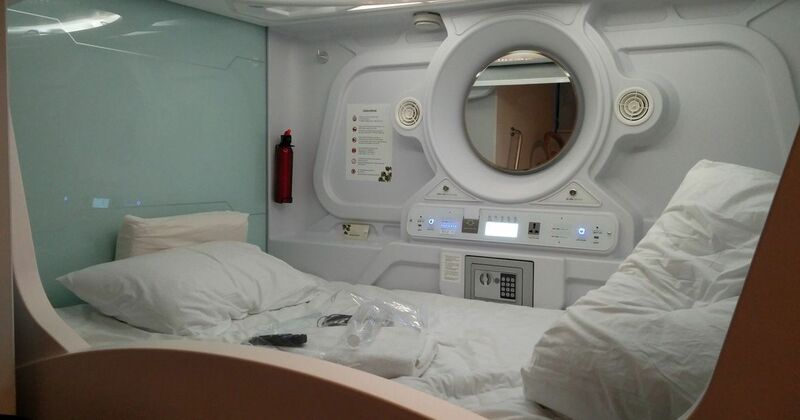 Ranging between 50 square feet and 90 square feet, the capsule hotel’s pods are considerably smaller than the typical Mumbai apartment, which shrunk by 26% between 2010 and 2015 to 1,000 square feet (each of which costs an average of Rs 26,449). The pod is tinier than the typical Mumbai slum tenement, in which close to half of the city’s population lives. But capsule hotels or capsule-sized homes might be the future of urban housing some day – tiny houses and micro-apartments are already being considered in increasingly overcrowded cities. After the 2008 recession, a major chunk of laid-off workers, left homeless, sought refuge in the coffin-like pods in Japan. 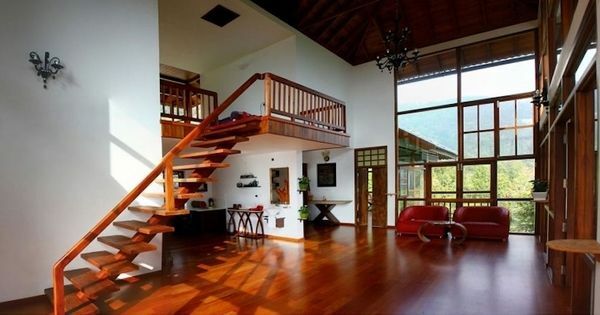 This type of living is not restricted to Asia but is gaining acceptance across the world – the American Tiny Living Movement, for instance, has seen people forced by never-ending debt, to move to compact Ikea-like homes. Buzzfeed News recently uncovered plans by London developers for homes of 6.7 metres, 30 metres below the minimum requirement for one-bed flats, with no bathrooms. These movements ensconce the reality of housing shortage under the terms “innovation”, “sustainable”, and “minimal” and put the onus on tenants, instead of addressing the problems that led to the housing crisis. These movements also occasionally embody the worst in minimalism – a rigid conforming to “less is more”, without taking into consideration the role that housing might have to play in the general well-being of a person. The inherent belief that while private space shrinks, modern cities have everything that people might require: cafes, bars, public parks and libraries, doesn’t really hold true in most world cities. Even if such a situation were possible, it would mean a loss of privacy and solitude that is almost essential to function in today’s hyper-connected world. Sometimes, people realise, as the family grows in size and time passes, not all of life can fit inside an apartment less than 1,000 square feet. At approximately Rs 2,000 per night, Urbanpod’s tariff in Mumbai is commensurate with the city’s exorbitant real estate prices rather than the cheap pricing of Japan’s capsule hotels – which ranging from $30 to $50, are a fraction of Japan’s per capita income of around $32,000. Yet, this is close to a third of the price one can expect to pay at a standard business hotel in Mumbai, which could prove to be the clincher if the venture is to succeed. The price increases expectations which are instantly dashed at the variety of cost-cutting measures on display. The contortions one is forced to make to enter each capsule trumps the novelty of it, which only lasts the first couple of times you get into your pod. Pod living, I realise, is a young and perpetually enthralled person’s game. One of Urbanpod’s co-founders told the Economic Times, “Our main target segment will be people from 18-50 years, who are students, entry level executives, pilgrims among others who are looking for affordable, hygienic and safe accommodation,” he said. Despite the price, the inability to completely relax in a pod, could perhaps have a deeper reason than the confined interiors of the capsule. One of the reviews on the travel website Tripadvisor, while praising the cleanliness, says, “Minus points: too smart a room, very less human intervention, you have to punch card at every damn point.” Lack of human interaction apart, there is also the industrialised nature of the environment which can tend to set one’s teeth on edge. Its minimalism highlights the temporal nature, the lack of colour or character recalls an institution, never allowing one to feel truly relaxed. As night progressed into day, the world inside the embryo remained unchanged. Sleep came in spurts. The panels inside the constricted space had buttons for all a modern traveller could desire – power socket, three kinds of lighting arrangements, a television set with cable, and the intriguingly-named air button, which had no connection to oxygen, and only powered the air-conditioner – but lacked freedom, both of a physical and a more deeper subconscious kind. The stay ended with a breakfast buffet, included in every package, and a deep longing for the chaos and expanse of the outside world.